Customs agents at Portugal's busiest airport found the drugs on the man's body, police said in a statement. Lisbon, Portugal: Portuguese police have detained a man who arrived at Lisbon airport on a flight from Brazil wearing "fake buttocks" that contained about a kilo of cocaine, police and reports said Tuesday. 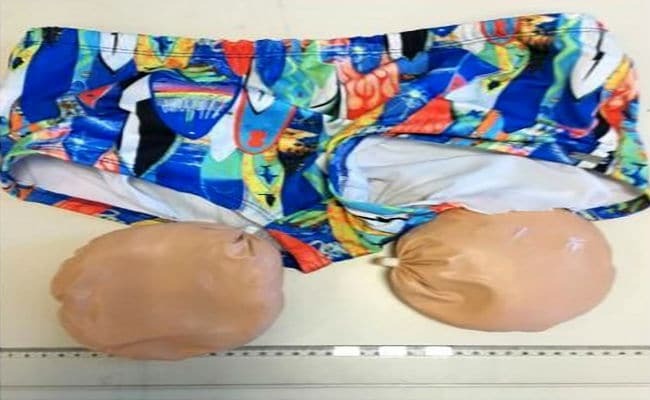 While not specifying exactly where the drugs were found, the statement was accompanied by photos of a pair of multicoloured swim trunks that had two brown bags attached to the rear. Daily newspaper Publico and other media said the man was arrested after he arrived from Belem in northern Brazil wearing "fake buttocks" stuffed with cocaine under his swim trunks. He had also swallowed bags of cocaine, it added. Police said they arrested a second man at Lisbon's main rail station who they suspect was the intended recipient of the cocaine. The two men, aged 32 and 40, face drug trafficking charges.